A cycling machine does more than just provide a workout. It adds safety to a training session along with entertainment and a range of amenities. 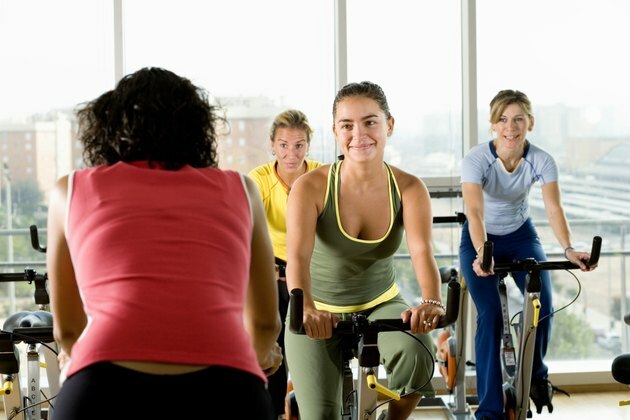 Physical benefits abound, which is why cycling machines are such a staple at gyms. Some people also have them in their homes. Cycling machines can provide results that are similar to or greater than bicycles. They offer a workout option for people who can't go cycling outdoors for reasons related to health or location. A cycling machine provides cardiovascular and strength-building benefits. Pedaling for long periods of time increases your heart rate, helping improve circulation and breathing. A cycling machine also helps you burn calories through your workouts, a major key in losing weight. Your legs also will see benefits, as the resistance from cycling machines can be used as weight training. Consistent workouts on a cycling machine should lead to less fat on your body and stronger, more toned legs. A cycling machine gives you cardiovascular and strength benefits while taking only a small toll on your body. Physical therapist Matthew Goodemote, on the Arthritis Today website, touts cycling machines for people with arthritis and osteoarthritis because there is much less potential for injury when compared to other types of exercise. Running pounds your joints, which can lead to knee and hip pain. All your weight is on the seat when using a cycling machine, so you are not stressing other weaker areas of the body. A cycling machine is a heavy object and stays in place when you use it. Compared with a bicycle, you do not have to worry about tipping over or falling from an elevated position, nor share the road with motorists, which can be dangerous. A helmet is not necessary and neither are padded bike shorts, demonstrating the safe aspect of using a cycling machine. Using a cycling machine enables you to take advantage of amenities that are common on the machines. The Spirit XBR95, for example, has fans that swivel to keep you cool during exercise, an MP3 audio jack and speakers so you can listen to music while you exercise and a 7.5-inch display console that details stats and information for your workout. There also are remote adjustment keys on the handlebars on each side of the seat, so you can alter the resistance without leaning forward to the console.